Feel comfortable at home with a quality Dressing-gown that you can wear. Good thing our team has listed the cheap Dressing-gown deals from the most trusted and reliable brands and online retailers. 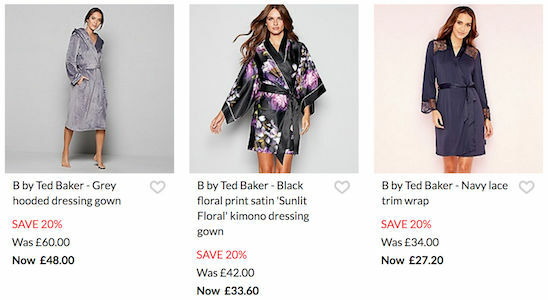 Our team of community deal hunters has listed the latest cheap Dressing-gown deals and promotions you may want to check out. Spending money on quality Dressing-gowns that are offered by Sports Direct, Amazon, eBay, and other reputable UK retailers is a great deal. You can get as much as 70% discount on selected Dressing-gowns. There are lots of designs that you can choose from. Yoda Dressing Gown (Children's) - HALF PRICE! All the latest affordable quality dressing gown deals! A dressing gown, morning gown or bathrobe is a type of robe that are loose-fitting. They are outer garments that can be worn by both men and women. These kinds of clothing can be worn over your nightwear or any other clothing. Other people even wear it with nothing underneath. Dressing gowns are usually worn around the house to feel comfy. People even use dressing gowns after taking a bath or after dipping in the pool. Dressing gowns are worn for convenience and for warmth. It is a convenient covering for your nightwear when you are not yet in bed. It can also be a form of lingerie. A dressing gown is a loose and open fronted clothing that can be closed using a fabric belt. Dressing gowns are made from absorbent or toweling fabric. It can easily absorb water so it can serve as a towel and as a body covering. Itc can be made from different kinds of material. Moreover, it can be worn any time of the year whether it is summer or winter. Some people even use these clothing outdoors. People can wear it on the beach or at a swimming pool resort. Dressing gowns are very comfortable to wear. You can wear them at home or at the beach. You don’t have to bend you wallet with an extensive selection of quality cheap dressing gowns you can find here at Latest Deals. FInd everything from classic mens dressing gown to trendy dressing gown womens on sale all year long. Dressing gowns are made from various fabrics. There are satin dressing gowns for the bedroom, cotton dressing gown for the bathroom, and winter dressing gowns for those cold months that you can purchase. There are also long dressing gowns and luxury fleece dressing gowns that will not compromise your budget. Choose the one that will suit your needs and will bring out your personal style. Our community of bargain hunters are always on the lookout to find the best dressing gown special offers, discounts, and price drops from major UK retailers. We also have a team of money-saving experts who regularly share essential tips and tricks that will be able to help you save on your instore and online shopping. Majority of online UK retailers have sale events, seasonal clearances, and flash sales where you can save as much as 50% off on a wide range of dressing gowns for adults and children. Watch out for their Black Friday and Boxing Day deals where their prices are reduced even further. If you want to maximise your savings, make sure to use the latest dressing gown discount codes we have here. We also have voucher codes where you can get freebies or free shipping. Just spend within your budget and we can assure you that there is an item that will capture your interest. Feel comfy with quality but cheap clothing and get great value for your money. Make sure that you select the right size so that you will not encounter any problems when you receive the actual items. Cotton. this is a natural fibre consisting of cellulose. This is one of the most commonly used materials in manufacturing textile fabric. Cotton dressing gowns absorb water easily. It is mostly used after taking a dip in the pool or after taking a shower. Cotton dressing gowns are suited for hot climates since it absorbs perspiration. Silk. Dressing gowns that are made from silk are very comfortable to wear but they can be expensive. Silk dressing gowns are thin and lightweight. It does not really absorb water very well so it is not suited to be worn after taking a bath. It is best used around the house while relaxing. Microfiber. This is a synthetic material that is usually made from polyester or cellulose. It is woven by textile companies to mimic the appearance of natural fiber cloth. With the advancement of manufacturing, they have made microfibers to be breathable and absorbent. They can also make the fabric as thin as possible. It is also very lightweight and soft. Wool. Dressing gowns that are made from this material are commonly used for places that have colder climates. Wool is a natural material that can prevent heat from escaping and cold from penetrating your skin. It is also low maintenance and can be cleaned easily. Flannel. It is a soft-woven fabric that is loosely spun. It is usually made from wool or cotton. Terry. It is usually made from woven cotton. They are made with uncut loops on both sides. This makes it very absorbent. Velour. It has cut loops and absorbs water better It also provides the user with a luxurious feel because it is very soft and comfortable to wear. Waffle. The fabric is loose and the weave looks like a grid. It is designed to be lightweight this can be applied to any kind material including cotton and silk.